Clark County commissioners tapped former State Gaming Control Board Chairman Mark Lipparelli to fill the state Senate District 6 vacancy created by Mark Hutchison’s election to the lieutenant governor post in November. Clark County commissioners on Tuesday tapped former State Gaming Control Board Chairman Mark Lipparelli to fill the state Senate District 6 vacancy created by Mark Hutchison’s election to the lieutenant governor post in November. The commission’s unanimous decision fills a key swing Republican vote in the Senate’s narrow GOP majority, which will be 11-to-10 seats in the 2015 session that begins in February. Commissioner Larry Brown, whose district overlaps Senate District 6, said Senate Republican Majority Leader Michael Roberson of Las Vegas recommended Lipparelli. Brown said GOP Gov. Brian Sandoval also “weighed in,” influencing the decision. 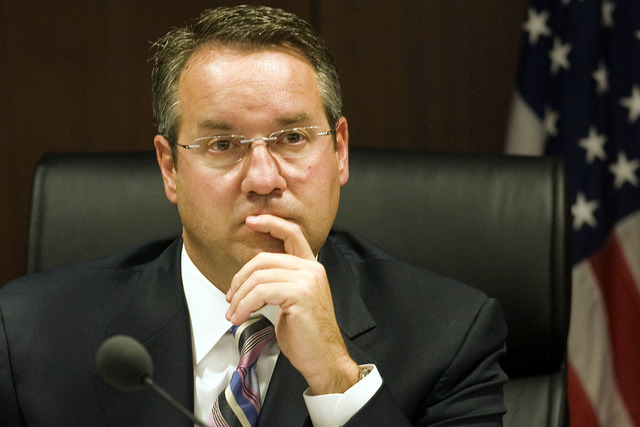 Sandoval, a former Gaming Commission chairman, appointed Lipparelli chairman of the Gaming Control Board. Lipparelli did not attend the hearing, but said afterward that he’s looking forward to serving. By law, commissioners were required to appoint a Republican because it’s Hutchison’s party. Hutchison resigned his Senate seat Monday. Roberson, who orchestrated the GOP takeover of the Senate, said Lipparelli would be a strong Republican addition. Brown said the commission expedited the process of filling the Senate seat so Lipparelli could participate in training for incoming lawmakers in Carson City. Some 11 people applied for the post. Brown called them a highly qualified group. He said the applicants included entrepreneurs, civil engineers, public safety officers and veterans, all of whom had extensive records of community service. “Sometimes we hear, ‘Why don’t more qualified people get involved in state politics?’” Brown said, adding that in this case “many, many of the candidates” were well-qualified for the Nevada Legislature. Besides talking to Roberson and the governor’s office, Brown said he also met with constituents in the district and read letters about candidates from people living inside and outside the district. Commissioner Chris Giunchigliani, a former lawmaker with strong Democratic views, said she backed Lipparelli partly because he appears to be a “moderate” Republican. She said Lipparelli couldn’t say if he would seek election to the seat in 2016, when Hutchison’s four-year term is up. “At least he admitted he was not sure at this point,” Giunchigliani said. 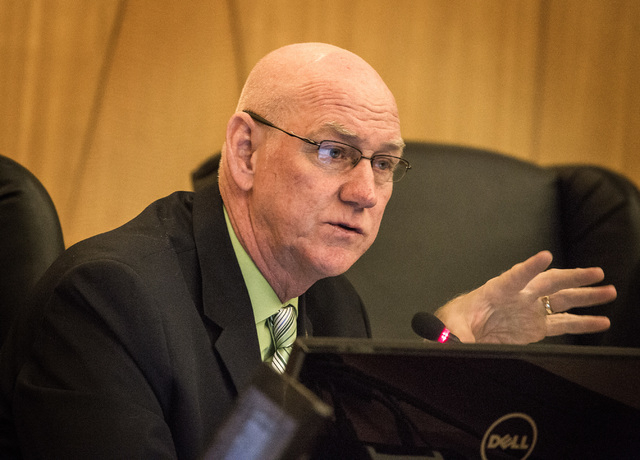 The commissioners said they also would like to move quickly to fill another vacancy after Assemblyman Wesley Duncan, R-Las Vegas, announced last week that he would resign his seat to become Attorney General-elect Adam Laxalt’s top assistant attorney general. Brown said the application process will be open immediately for Assembly District 37 and the commissioners will take up the matter at their next meeting on Dec. 16. Review-Journal writer Ben Botkin contributed to this report. Contact Laura Myers at lmyers@reviewjournal.com or 702-387-2919. Find her on Twitter: @lmyerslvrj.